From May 21 to 25, 2016, 11 of the 16 young artists who attended the first educational path IL MESTIERE DELL'ARTE in September 2015 at Il Vivaio del Malcantone, participated to an intensive five-days-session at Le Murate. Progetti Arte Contemporanea focused on a few modules of the R2E Curriculum that appeared to need further deepening according to the evaluations of the first testing period. This second pilot training, coordinated by Pietro Gaglianò, Caterina Poggesi and Marina Bistolfi, focused on three modules that the participants had asked to deepen further: Communication (one full day), Project Design and Management (two full days), Organisation and Administration (two full days). For the Communication module, SMart expert Jérôme Ramacker was invited, as an exchange with Pietro Gaglianò’s module “Working in contemporary societies” tested for the first time at SMartBe’s second national pilot training. For the organisational and administrative modules, we invited as external expert, next to Marika Errigo, Giulio Stumpo of SMartIt. Their training focused on the relations between the labour market in the field of culture and creativity, and the rights related to the employment and the independent workers. On the other hand, the training analysed practical aspects of the organisation, production, costs and income of a performing arts production, as well as the public and private funding opportunities, with concrete case studies. It was extremely fruitful to test the modules after eight months with almost the same group, who had kept collaborating in the meantime in a new informal collective, and had developed 3-4 new project ideas that were used as concrete study cases during the training. The second Multiplier Event took place immediately after the pilot, on May 26 and 27 at Le Murate within the frame of the 23rd edition of Fabbrica Europa Festival: http://fabbricaeuropa.net/events/il-mestiere-dell’arte-–-evento-conclusivo/. It was opened by the head of the Culture Depertment of the City of Florence Tommaso Sacchi, and was attended by ca. 40 participants: the young artists participating to the pilot, other young and mid-career artists, curators and teachers in art schools, cultural organisers and actors of the artistic labour market. In the first session coordinated by Pietro Gaglianò, grouped in tables of discussion all guests had the opportunity to open a peer-to-peer confrontation about the issues, problems and critical situations that art workers have to face. Mixing artists and professionals from different domains (performing arts, visual arts, art schools, festivals), the discussion tables were animated by different debates: the generational gap as opportunity or as obstacle; the lack of adequate spaces to have a fruitful meeting and a professional exchange with operators; the lack of tools to individuate who is the right recipient; the relationship between market rules and artistic creation; the freedom of the artist, his/her right to be doubtful and to not correspond to labelled profiles. 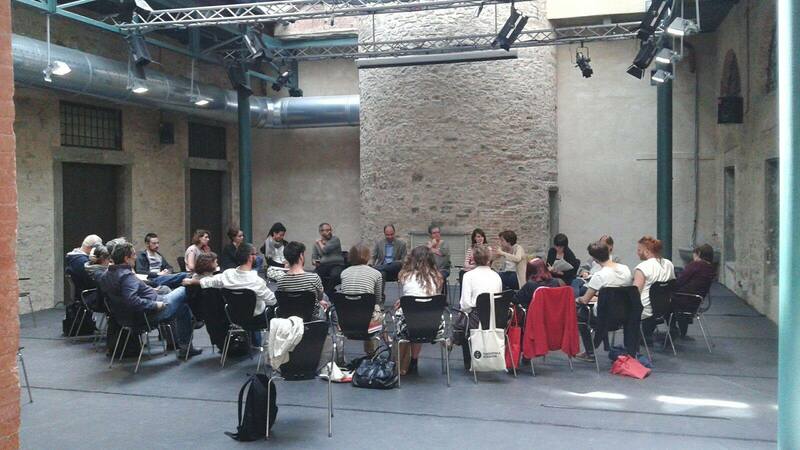 In the second session coordinated by Giulio Stumpo, a round table discussion was organised with the aim to find links between artistic and creative jobs and new welfare systems. Experts of different sectors were invited to share their experiences, and were asked to find the links between freelance and artists. The interesting conclusion was that a common framework emerged: creative workers and artists often have the same problems to solve and face the same difficulties (late payments, lack in welfare state, lack in job rights, etc.). This new perspective and the link between sectors that usually do not talk a lot to each other, gave the opportunity to explore new relations between the employed and the independent workers and to start a discussion on what kind of new jobs and new rights are needed to ensure a more sustainable development model. The third and last session, coordinated by Caterina Poggesi, was dedicated to a performed demonstration of the module “Facilitation”, meaning the capacity to accompany a process, and optimise resources and specific characteristics of target and context. The theoretical concepts were shown through a practical improvisation with physical themes and tasks in a defined performing space, where the performers had to compose some collective choreographic moments, respecting the roles given by the coach in an example of live composition and conducting. The following analysis of the process focused on facilitating methods, together with other core issues about education and today’s society.